Discover the main neighbourhoods and monuments of Paris on this unique tour. 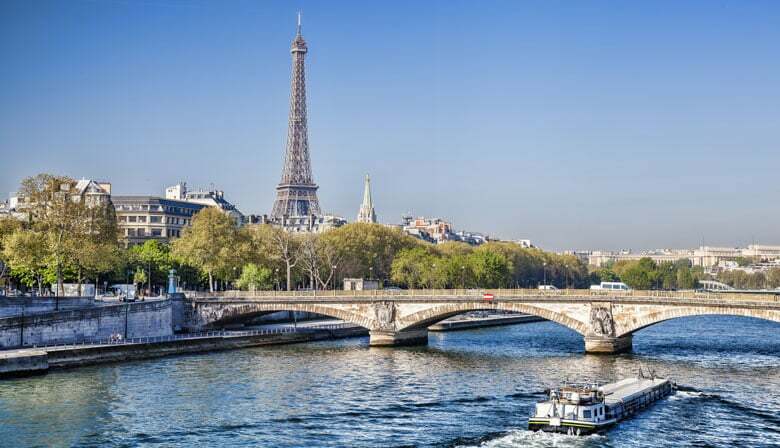 This excursion includes a city tour by panoramic coach and an hour-long cruise along the Seine River. It offers the ideal opportunity to experience the magic of Paris. Your tour by air-conditioned panoramic coach will give you the chance to visit the city of Paris and learn about its history and most important sights with an audio guide (individual headsets). Marvel at the following iconic sights linked to Paris's history and heritage: Place Vendôme Square - Comédie Française Theatre – Louvre Museum - Pont-Neuf Bridge - Saint-Germain-des-Prés - Notre Dame Cathedral- Place du Châtelet Square - the Conciergerie - City Hall of Paris - Place de la Concorde Square - the Petit and Grand Palais - Avenue des Champs-Élysées - Arc de Triomphe - Eiffel Tower - Invalides - Madeleine Church and the Opera House. Aboard a panoramic bus, you will discover the main monuments and neighborhoods of Paris, from the Eiffel Tower to notre-Dame, without forgetting the Invalides or the Latin Quarter. You will immerse yourself in the daily life of Paris and discover how Parisians perceive their city in their own particular way. The audio commentaries in the language of your choice will make you discover the history and the architectural evolution of the City of Lights. Comfortable coach; informative Guide; lovely lovely Cruise. Tour guide and driver were very friendly and helpful. All the major sights were seen.